He was born in Molotov (Perm) on April 16, 1951 in the family of a worker and an employee. Father – Skopintsev Vasily Andreevich – front-line soldier of two wars. Member of the Great Patriotic War and the Soviet-Japanese War. He worked as a foreman of motorists in the testing department of rocket engines of the Perm Engine Plant. Mother – Skopintseva Galina Ivanovna. She worked as a director of a training and industrial combine of consumer services. 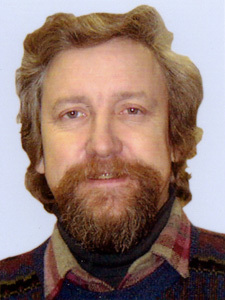 He worked as a loader, pipe-layer, mason, machinist of a tower crane, a mechanic, carpenter, janitor, researcher at the Laboratory of Mathematical Methods of Research in the Krasnoyarsk branch of the All-Union Scientific Research Institute of Construction and Road Machinery, senior researcher at the Department of Machine Parts at the Perm Agricultural Academy. The first caricature was published in the newspaper “Krasnoyarsk Komsomolets” in 1974. He was published in the regional and central mass media, in the newspapers Izvestia, Komsomolskaya Pravda, Literaturnaya Gazeta, Trud, Vechernyaya Perm, Smena, Nature and Man, Student Meridian, Krasnaya Burda, Shop, Crocodile. Member of the All-Union and international competitions of cartoons. Laureate of more than ten awards of different dignity: Legnica (Poland), Tokyo (Japan), Kiev (Ukraine), Vladivostok, Tyumen, etc. from 1974 to 2006. Works are in private collections in Perm, Belgium, South Korea. Founder and president of the Perm club of cartoonists “Stain remover”. Manager of advertising in the firm “Permavtotekhnika”.